A cheap Kindle sale is never that far away in these parts as Amazon is keen to stay atop of the ereader pile. Kindle prices on most of the devices are already great value given the high quality you get in your hands. 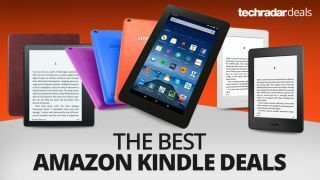 We're rounding up all the cheapest Kindle deals as various retailers throw down to try to offer your the best bargains. We've covered every readily-available model including the basic Kindles, the excellent all-rounder Paperwhites and the super fancy Kindle Oasis luxury ereader. If you're interested in more than just reading ebooks, the Fire tablet range is covered too - they're a much cheaper alternative to those pricey iPad deals. Naturally, we'll explain the differences between the devices too so you can make the most informed decision about which one suits you best. We provided a quick overview directly below, keep scrolling though and you'll see an extensive list of Kindle prices for each model. What makes a good Kindle price? These ereaders don't have LCD screens or powerful internal components. So you'll find Kindle sale prices are far cheaper than tablets and phones. The screens are fantastic for glare-free reading and an immediate improvement over using the Kindle app on your phone or tablet too. If you can find the Kindle Paperwhite for under US$129/£120/AU$199 you're getting a good price. The new entry-level Kindle 2019 model will surely see some discounts soon on its $89.99/£69/AU$139 price. The top of the line Kindle Oasis model prices start at $269/£229/AU$389 and rarely drops lower. What do 'Special Offers' mean on the Kindle listings? When looking at a Kindle ereader listing, whether it's on Amazon's website, or on a different retailer's site, you'll often see 'includes special offers' in the title or item description. Choose without special offers and the price will jump up £10/US$20. Essentially, these Special Offers act as Amazon-based screensaver-style advertisements on your Kindle device. So when you pop your Kindle on from sleep mode you'll see an ad for a book on Amazon's Kindle store, or maybe a third party ad. Annoying right? Actually, I opted for with Special Offers (I do love a cheap deal), and it's not bothered me one bit. You can swipe the ad away easily (no trying to find the tiny X icon here) and get on with your reading straight away. When in sleep mode, the ads cycle on the screen, but they're not illuminated and they don't seem to consume any power. They don't slow anything down when powering on the device after shutdown either. Seeing as they don't interfere with the experience at all, I'm glad I didn't spend the extra money to block them. Hey, some of them (sales ads etc) have been worth clicking through to. If you really don't like them though, you can always pay the difference at a later date to get them removed. So we'd opt for the cheaper 'includes special offers' option first. Amazon has an updated version of the excellent Kindle Paperwhite and it's just been released. And this is no mere by-the-numbers update with a deep dive on internal spec sheet required to spot the differences (let's leave that to the MacBooks right?). The 2018 version of the Paperwhite is so good you might be tempted to ditch the previous version, which we still love very much. The backlit screen is now flush with the bezel, meaning no more places for dust or hair to get stuck. And part of the reasoning behind this upgrade is to ensure the Kindle Paperwhite is now a waterproof ereader, just like the far more expensive (but absolutely beautiful) Kindle Oasis. The cheapest model now has double the storage capacity at 8GB which is handy if you you're reading image-heavy books like graphic novels/comics. And it's 20 grams lighter. That extra space is also handy for audiobooks, a new addition to the Paperwhite that you can take advantage of via bluetooth speakers/headphones. We expect prices to drop on the older model to clear stock out, so you could get a decent discount there (see further down this page for the older Paperwhite prices). As for the new Kindle Paperwhite 2018, prices start at $129.99/£119.99/AU$199. The 2018 Kindle Paperwhite is well on its way to surpassing the previous model, which was already the best value ereader on the planet. Amazon's latest take on the entry-level Kindle was given a boost for 2019 by including a built-in light, meaning you don't have to get the Kindle Paperwhite if you want to read your Kindle at night without any extra lighting in the room. It's a neat upgrade, but it has pushed the starting price up a little compared to the 2016 starting Kindle. The Amazon Kindle with a built-in light starts at $89.99 / £69.99 / AU$139. The screen itself though is still only 167 ppi, opposed to the Paperwhite's higher resolution of 300 ppi. The Paperwhite (which is now waterproof and designed with a flush screen against the bezel) does get some chunky discounts at multiple points of the year, so if you time it right, you may not have to pay much more to get that instead of this basic (if improved) Kindle. For the full rundown, check out our latest Kindle review. The luxury waterproof ereader you've been waiting for? The reinvigorated all-new Kindle Oasis costs US$249/£229/AU$389 for the cheapest Wi-Fi version. This is an upgrade over the older Oasis (which is no longer available) and a huge improvement. It's 15% cheaper, bigger and also the first waterproof kindle, arguably justifying the top end price-tag. The Kindle Oasis is also the first kindle to support Aubidle audio books, although you'll need a pair of bluetooth wireless headphones to use this feature as there's no built-in speaker or 3.5mm headphone port. This new Kindle ereader's 7-inch screen makes it the largest in the current Kindle range and tempting for readers wanting to view a larger page, meaning you won't have to turn pages as often. The page turn buttons are given a wider bezel on the side than the Kindle Voyage, making it easier to hold one-handed - the screen will flip over to accommodate left-handed readers too. The considerably cheaper Voyage and Paperwhite models are excellent alternatives and feature the same screen resolution. That larger screen and waterproofing for peace of mind are pretty tempting though. The 6th generation Kindle Paperwhite was the best value Kindle around until the newer version landed, easily beating the likes of the Kobo Aura on performance and design. This model comes with screen lighting which was new to the series at such a low price before, although it's becoming increasingly standard now, even on the entry-level Kindle. Amazon managed to create a fast electronic ink tablet with inventive reading apps. You can lookup words in the dictionary without leaving your page, or even flick through any relevant Wikipedia entries for most words or terms. The latest version's 300 ppi screen is now just as good as the more expensive Kindle Oasis. Unless you see a super cheap price in the comparison chart below though, we'd opt for the newer version mentioned earlier. The new 2016 Kindle (also known as the 'All-New Kindle' and ‘Kindle Touch 2016’ in Australia) is the updated version of the entry level Kindle last released in 2014. If you want the cheapest option, this is the one you should go for as the 2014 version has been discontinued and any deals you see are probably for preowned or refurbished units. With prices starting around £60/US$80/AU$109 you're getting a bargain. The 2016 model is also available in white (the 2014 was black only), it's lighter, thinner, has double the RAM speed and double the storage capacity at 4GB. The lack of a lit screen is the only thing holding it back really. Want something a bit more advanced than a Kindle ereader? If your needs are a bit more media-intensive as you want a handheld device for gaming, viewing movies (especially on Amazon Prime) and browsing the web, an Amazon tablet could be for you. Naturally, there's a Kindle app, but the glass screen can be a hindrance for extended reading sessions. Australian readers should note that these Fire tablets aren't available Down Under. Sitting at the budget end of Amazon's Kindle tablet range, the Fire 7 is generally the cheapest of the lot as it doesn't have a HD screen. Amazon has just refreshed the Fire 7 range though and it now comes with Alexa, the virtual assistant from the Amazon Echo devices. You can also have different profiles - some for the kids - through Amazon FreeTime. For this low price, the Amazon Fire HD 8 is one of the best tablets around, especially if you're happy to jump into Amazon's ecosystem. Mobile gamers will appreciate the improved tech inside the more recent versions as it comes with more storage, 50% more RAM and a 1.3GHz processor. Better yet, the 2018 edition seen below now comes with integrated hands-free Alexa - the excellent virtual assistant from the Amazon Echo range. You're not paying any more for the privilege either, so we'd only recommend the latest version. The new and improved Fire HD 10-inch tablet finally joins Amazon's other Fire tablets with the 'All-New' treatment. This is good news for buyers as this replacement is cheaper than the scant few deals available for the old Fire HD 10. The cheapest model now comes with 32GB of storage instead of 16GB, has a clear full HD 1080p screen and has twice as much RAM to run even faster than before. All this and the RRP comes in at just £149/$149. The headline feature though is the introduction of the voice-controlled Alexa app (one and the same as the Echo devices) to the tablet. We're a bit sad to see the old aluminium body go, as it looks a little less premium with the plastic finishes (black, red and blue available at launch so far). But seeing as we'd be putting a protective cover on it anyways, it doesn't really make any difference when we think about it. Got tech-hungry children, but don't want them to get their grubby mitts on your tablet or phone all the time? The Amazon Fire Kids Edition tablet could be the answer. In addition to enhanced durability (look at the size of that housing), it also comes with a two-year guarantee, which covers the tablet -even if the kids break it- no questions asked. There are plenty of software safeguards too, such as making sure they can only watch appropriate content online, adjustable screen-time limits and access to loads of age-appropriate games. Bigger and better than the Fire 7 Kids. You're getting a larger screen with HD visuals. The sound is better too as the mono speaker has been banished for Dolby Atmos and dual stereo speakers. The battery has been boosted up to around 12 hours, compared to the eight offered by the smaller model and you get 32GB of storage instead of 16GB. You're still getting that same tough build quality and two year guarantee too. Come on, don't make your child grow up with SD visuals. Doesn't everyone deserve HD, even if they are going to smear jam all over it and throw it around a bit? We check our Kindle deals every day to make sure they're always up to date and available!